Finished up this block for Heidi in our Block Swap 2 group. The inner curves are challenging to piece! When I made a small quilt with NYB blocks a while back (oh! it was 5 years ago! ), I hand pieced the curves. These ones were done by machine, and didn't turn out as nicely as I would have liked. 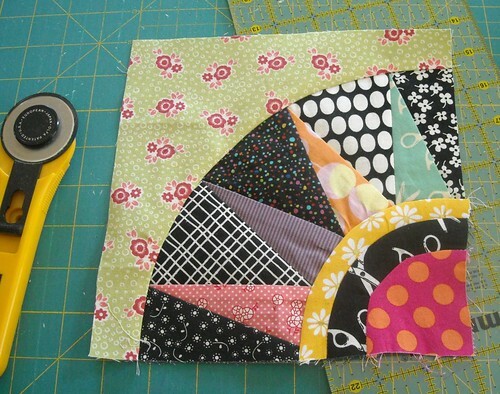 I am almost done cutting my 2" squares for my turn in Bee Beautiful. I just need to cut purples and a few blacks and greys. This is about 750 2" squares. I am a little distracted from sewing--reading my first e-book. (My first, you know, commercial novel-type e-book.) I got the kindle app on my Droid and bought Mockingjay today. I haven't ever read a novel this way before; I'm not sure how I feel about it. I'm glad I didn't have to go to the store to get it though, or wait through the library hold list that is about 500 people long. I'm about 3/4 of the way through Mockingjay on my Droid! I love having it with me wherever I go. It's definitely different reading it on a screen, but I don't mind making the adjustment. It's great reading in bed at night with the black background and white letters! Love your New York Beauty! Your New York Beauty is really nice! I love the colors and your work is beautiful. Your stacks of 2" squares are so pretty! That is a lot of work! What a great beauty block - you did a grand job of combining some awesome patterns...and dude that is a of squares! i LOVE nybeauty!! i keep a seam ripper right in front of my machine--i use it ALL the time and find it sometimes takes me several times to get things exactly as i like--i've found if i take a one stitch wider seam on some pieces it makes all the difference. had to do that today to get something to fit. Nice fabrics, nice job. I love this block... so lively. A challenge to sew, too. Mockingjay! My boxed set of all three books should be arriving today, and I'm going to reread the first two before I start in on the new one. I'm excited to hear what you think of it! Reading Mockingjay too. I've thought about getting the e-book app on my iphone but not sure if I'd like it (except that I'd have my book with me everywhere). Love to hear what you think of it when you are finished. What a beautiful quilt block!